As far as the weather was concerned it all went as planned. We knew we had chores to do this morning to get back on schedule after the heavy wind and rain of Sunday night. First I rolled out the awning so that it could dry. I'm glad I did, as water ran off it as it unrolled. Then it was a deep clean of the bathroom, all carpets and floor covering out, then brushing and hoovering through. There was also the drying of the three storm straps as well as laundering the towel I had used to mop up the rain on the floor during Sunday night. Originally we had planned to take ourselves off on a bike ride this afternoon, but we had a change of plan. Two years ago whilst in France, returning from Istanbul, my younger brother Richard and his wife Sue were holidaying there as well, and weren't a million miles away, but far enough to make it difficult for a meet-up. 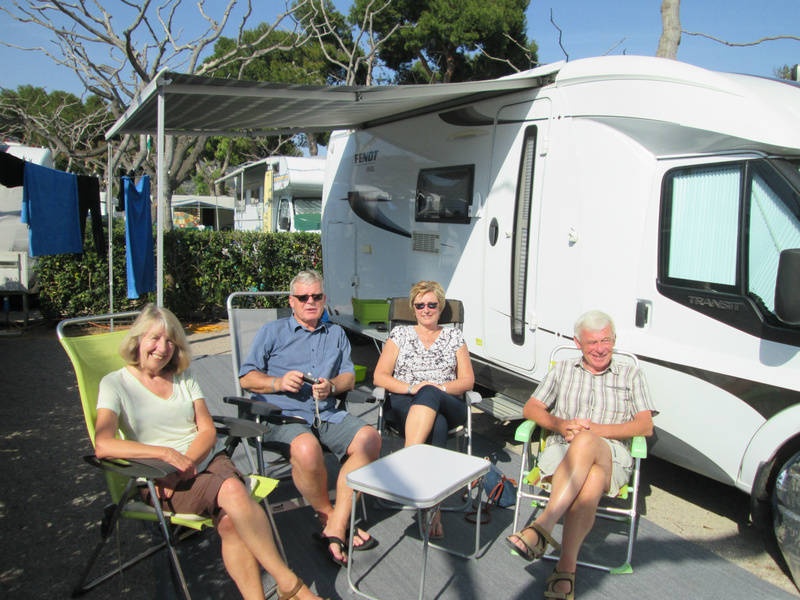 Yesterday they flew in to Alicante for a holiday in Denia, south of Valencia. Again it was a coincidence. I was hoping that we could drop in to say hello as we passed by, heading south next Monday, however we have now decided to stay here in Benicassim for another week as the nights in the interior of Spain are still quite cold, and I'm fearful that when overnighting without campsites I'll need to rely on the gas central heating, as the temperatures can fall to something like 4˚C inland. Although I have refillable LPG cylinders I can't refill them on garage forecourts, and so need to make the two full cylinders onboard last the whole trip. So it was a lovely surprise to get a text from them this morning asking what we were up to and could we meet up. So whilst I finished off the chores, they drove all the way here and spent a few hours with us and had lunch at the campsite restaurant. It wasn't a bad meal actually and quite good value. Prior to their arrival our very nice Irish neighbours came out of their motorhome clearly on their way out somewhere, so I cheekily asked them if I could borrow their two folding garden chairs as they wouldn't need them for a while. They said they were quite happy to let us borrow them, and not to worry if they returned before Richard and Sue left because they had two more in their motorhome garage. So there I was as the afternoon unfolded, sat in one of their chairs when CRACK! Half the plastic arm on the right hand side broke clean off. Why me? I attempted to glue it back in to place using Gorilla Glue which is pretty strong stuff, and held the broken piece in place with tape whilst the glue dried, how embarrassing. There wasn't much chance of the repair being a complete success but it did mean I could return the chair using just one hand rather than two. We asked one of our neighbours across the way if he'd take a picture of us all together and he kindly obliged, though I don't think he made his living as a photographer. After waving Richard and Sue off I went to return the chairs. Our neighbours were out, and so I left them both unfolded near their table before returning with a little note of thanks and an apology. I thought I needed to draw their attention to the chair in case they returned and one of them went to sit in it, the glue gave out, and they disappeared sharply to their right. I did hear them come back and went to apologise and thank them personally. I offered to buy I replacement chair but they were fine about it, they said they had four chairs onboard and carried too much stuff with them , so I'd just helped them out a bit. I'll make it right with them with some nice wine or something, and maybe I'll throw in a bottle of Gorilla Glue. Last night we watched on Channel 4 catch-up TV the first episode of 'Mutiny', a series which I heard Chris Evans on his BBC Radio 2 morning radio show raving about. It was really quite good, and so tonight we shall watch the second part. We may well go for that bike ride tomorrow morning. There are activities on site tomorrow afternoon and evening, though nothing we couldn't miss if we had to.